The Emergency Medical Services department offers career training for entry-level positions in emergency medical settings. Ambulance companies, fire departments, police departments, and various other industries requiring emergency medical services may employ emergency services personnel. The program has been designed to be completed in two years if you attend full time. However, there are entry-level expectations for skill levels in reading, writing, and mathematics. The length of time you take to complete the program will depend on your skills in these areas. Paramedic applicants. Have questions? Contact Roger Kennedy. 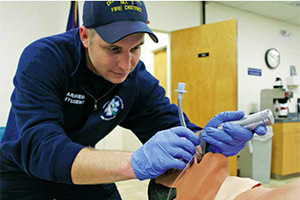 After successful completion of all requirements for EMT, Advanced EMT, EMT Intermediate, or Paramedic training, the student is eligible to apply to take the respective state and national certification exams. 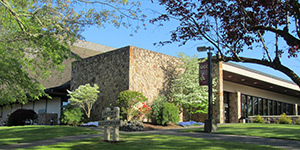 The department also offers training for Emergency Medical Responders and EMS continuing education. Take prerequisite courses to start the program. Get access to millions of dollars that are available to students - not just loans. There are scholarships, grants and work study opportunities too! Every student can use money for college. It can help you to be more successful. Plus, it can lower your debt load when you finish college. Some students actually leave college debt-free! Here are some important sources of money for college. Don't let these opportunities for financial aid pass you by. Act now! Decide. Commit. Succeed. 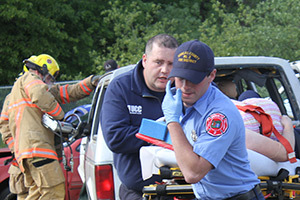 UCC's EMS program boasts a student success rate of 90 percent. Program staff are dedicated to preparing you for positions in the field.